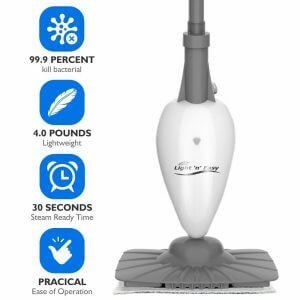 Looking for the best steam mop? You’re in luck, with our Home Flooring Pros floor steam cleaner reviews we’ve always got your back. And because each home is different we’ve made sure to find the best rated steam mop for your situation. 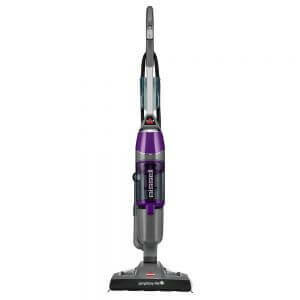 Read on or follow the quick links to get to the steam cleaner you want. Only distilled water without cleaning solution should be used. Hardwood and grout must be sealed before steam cleaned, and a low steam setting is recommended for hardwood, luxury vinyl tile and laminate. 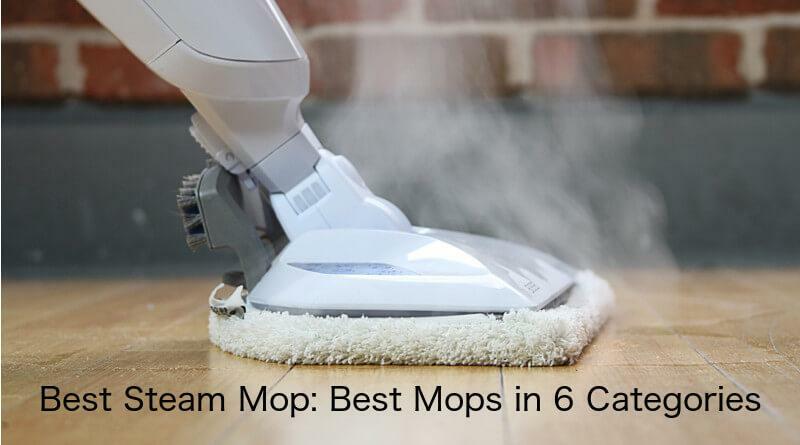 Click here for our recommended steam mops for wood floors. Check the warranty on your floor before using a steam mop, you may void your warranty if you use one. Cleaning pads for all models are washable unless labeled disposable, and replacement pads are available. Expect 12-20 washes from each pad from most brands. Pro tip: Treat pads with your favorite stain remover before laundering. Shout is one we recommend. All these steam cleaners have sanitizing power to kill more than 99% of viruses and bacteria. If you’re going to buy one tool this year for all your steam cleaning needs, we recommend the Shark Genius Pocket System S5003D. Here’s why: The Shark Genius steam cleaner allows you to customize its cleaning performance with three steam settings plus the Steam Blaster feature. It’s one tool ideal for everything from light sweeping to heavy-duty cleaning on all sealed hard flooring including hardwood. The list price for this Shark mop is $119.99 although we’ve regularly seen it on offer for just over $100. 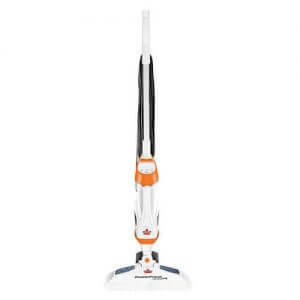 It’s more expensive than the popular Bissell steam mops but we think it’s a better performing and more durable steam machine which is why we vote it #1 overall. If we could change anything, we might add an On/Off switch (and a second year to the warranty). The mop is in Standby mode when plugged in, so remember to unplug it when not in use to avoid wasting energy. Also, the reservoir doesn’t detach, which is the trend in steam mops, but a filling flask is included. 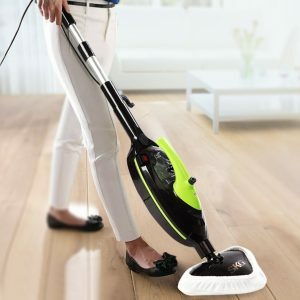 Our deliberations about the best 2018 steam mop were close, so we decided to include a Runner Up in this category, the Bissell PowerFresh Deluxe steam mop. The cord is 25 feet vs. 22 feet, so you can go further and change plugs less often. It’s backed by a 2-year warranty, and that says something about what Shark thinks of its product. The removable SpotBoost brush speeds the cleanup of stubborn dirt. Pro tips about the brush. First, it’s easier on the flooring to soften stuck-on dirt with steam or a light spray first, then softly scrub it loose. Secondly, we don’t recommend using the brush to clean all your tile grout because it will wear out. There isn’t a replacement at this time, and the bristles aren’t really stiff enough for tough grout cleaning. Spot steam cleaning is fine using the brush. We recommend cleaning the grout as a separate task using a nylon brush and an acid-free cleaner designed for the purpose. Where it’s not as good as the Shark: There are only two steam settings, and the head doesn’t swivel universally. We’re neutral about the scent discs. Some like the aroma, while others don’t want another chemical smell in their home. The Light ‘n’ Easy is a floor steam cleaner with good features, and it costs about $50. That combination makes it an excellent value and our choice for the best affordable steam mop for 2018. It’s also lightweight at about 4lbs; the Shark mentioned above weighs more than 8lbs by comparison. The only drawbacks are the single steam setting, rather than the two or three available on the other products, and the fact the steam output isn’t quite as vigorous as our top-rated models. This means you’ll need to work a little slower on tough dirt. Finally, we recommend buying a pack of 2 extra pads if you have more than 1000 square feet of hard flooring and want to do it all without washing a pad. The set is about $10. Cleaning up after pets requires a suite of tools, and that’s why the Bissell 1544A steam mop with its 13 accessories is the 2018 best steam mop for pets. We also give it high marks for the Lift-Off pod with its own handle and steam-concentrating nose that is ideal for cleaning and sanitizing pet carriers, beds, cat trees and condos, grout and corners that are hard to reach. There are a few minor concerns, but no deal-breakers. 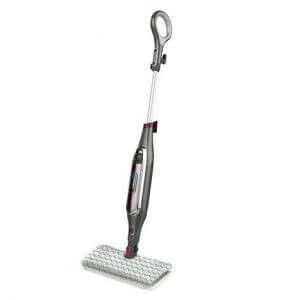 The flip-down scrubber is OK for light scrubbing, but it’s hard to get enough downward pressure for tough dirt. The pod takes two hands to remove, one to hold the pod and the other to push the release button, and the mop doesn’t stand on its own. This makes removing and replacing it a bit awkward, but you’ll soon have the hang of it. The fill hole isn’t conveniently located, so the steam mop has to be laid on its side to fill. This unit weighs more than 10lbs due to the Lift-Off pod, so doing stairs is a bit of a workout. Usually steam mops and upholstery cleaners are two separate tools, and that’s why the SKG 1500W Steam Mop is our top choice for a multipurpose steam mop. It handles hard-floor duties capably, and its ability to refresh and sanitize carpeting using the accessory is a bonus. In addition, the steamer component easily detaches from the larger handle to become a tool for steam-cleaning upholstery, curtains, blinds, garments, windows, showers, bathroom fixtures and more with excellent results. That’s the work of two steam tools for less than $100, a lot of bang for your buck. This is a heavier tool at 9+lbs, but the shoulder strap helps carry the weight. We love the versatility of this machine and continue to find new uses for the detachable steamer (the oven, car, pet cages). The cord’s 15-foot length might mean switching plugs once or twice more often during a cleaning job, but there’s less cord underfoot and wrapping around furniture legs. That’s a trade-off we’re comfortable with. If premium quality and performance are traits you’re willing to pay more for, then you’ll probably be happy with the Shark Lift-Away Pro Mop. This Shark steamer is designed to handle high-volume cleaning of sealed hard flooring. Dust your floors without steam or using the light “Dust” steam setting for daily care. 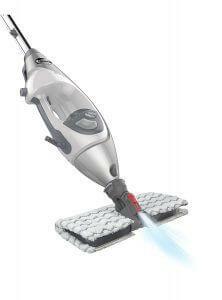 Use the “Mop” steam setting when moderate dirt is visible. Crank the mop to “Scrub” when serious cleaning is needed. Some users state that this unit leaves a lot of streaks behind. To eliminate streaks on this or any steam mop, change the pad when dirty and if it becomes soaked. If your pad becomes very wet, change it, or reduce the steam output setting. Thoroughly cleaning hard flooring is a two-step process of vacuuming loose debris and then steam cleaning the surfaces. If you want one tool for both steps, the best of the bunch is the Bissell Symphony 1543A designed with pet owners in mind but ideal for any home. This vacuum steam cleaner doesn’t have a rotating brush you might forget to turn off, and it’s lighter than most carpet vacuums, reducing the risk of scratching hardwood, vinyl and linoleum. The steam mop includes two washable pads for general cleaning and a small pack of disposable Swiffer Steamboost disposable paper pads for nasty cleanups you want to send right to the trash. Replacements for both are available. This is a hard-flooring vacuum and not designed for carpet. The heating unit on a small percentage of these fail within the warranty period, as they do on all steam mops. 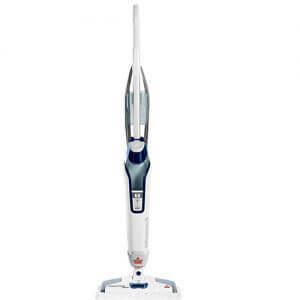 The good news from our experience is that Bissell stands behind its warranty and will be happy to replace your Symphony 1543A if it fails in this or any way in the first two years. Disclosure: Home Flooring Pros are dedicated to writing useful and well-researched content, including independent reviews of relevant flooring products. Some of the links included on our site are affiliate links which, at no additional cost to you, allow us to earn a commission. For more information click here.